View this sample resume for interior design, or download the interior design resume template in Word. Could your career use some refreshing? To be considered for top interior design jobs, resume expert Kim Isaacs says it helps to have a comprehensive resume. 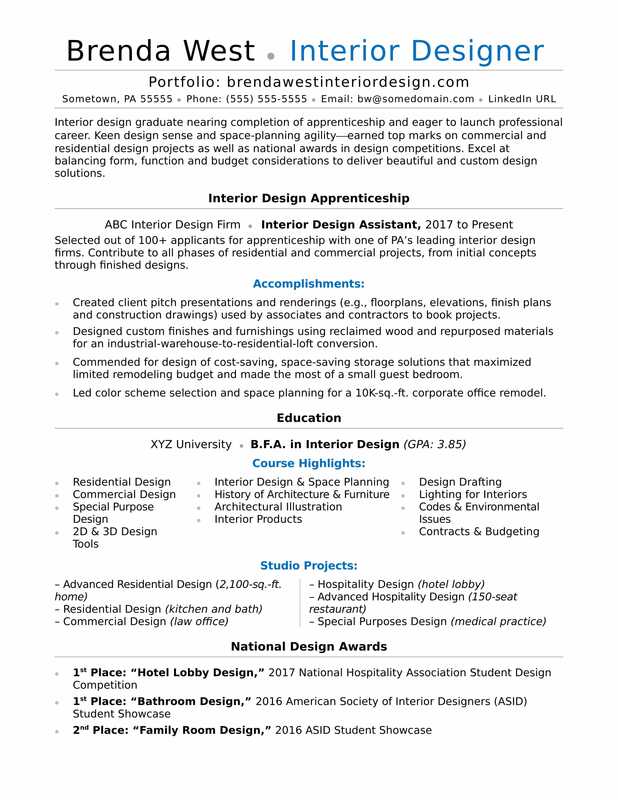 For resume writing tips, view this sample resume for an interior designer that Isaacs created below, or download the interior design resume template in Word. And if you need more help, get a free resume evaluation from the experts at Monster's Resume Writing Service. Jobs for interior designers are projected to grow by 4% (or 2,900 jobs) from 2016 through 2026, according to the Bureau of Labor Statistics (BLS). You'll find the highest level of employment for this job in the following states: California, Florida, Texas, New York, and Illinois; and in the following metropolitan areas: New York City, Los Angeles, Chicago, Atlanta, and Dallas. As an interior designer, you can expect to earn a median wage of $51,500 per year, or $24.76 per hour, according to the BLS. Additionally, you can search for interior design jobs on Monster. Interior design graduate nearing completion of apprenticeship and eager to launch professional career. Keen design sense and space-planning agility¾earned top marks on commercial and residential design projects as well as national awards in design competitions. Excel at balancing form, function and budget considerations to deliver beautiful and custom design solutions. Selected out of 100+ applicants for apprenticeship with one of PA’s leading interior design firms. Contribute to all phases of residential and commercial projects, from initial concepts through finished designs. Created client pitch presentations and renderings (e.g., floorplans, elevations, finish plans and construction drawings) used by associates and contractors to book projects. Designed custom finishes and furnishings using reclaimed wood and repurposed materials for an industrial-warehouse-to-residential-loft conversion. Commended for design of cost-saving, space-saving storage solutions that maximized limited remodeling budget and made the most of a small guest bedroom. Led color scheme selection and space planning for a 10K-sq.-ft. corporate office remodel.